FAQ: Can bladder tanks be used as frac tanks in the oilfields? I am interested in a collapsible oilfield frac tank. How often are the bladders used as frac tanks in the oilfield? Thank you for contacting us! 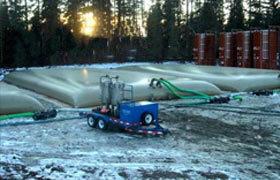 The Collapsible Frac Tanks are fairly new to the oilfield and mining industry. However, with many companies looking for economical solutions to their water, fracking liquids, or fuel storage, they are quickly becoming popular. When compared to a standard steel frac tank, the collapsible units can offer very specific advantages for the storage of brine water, process water, fracking fluids, and more. 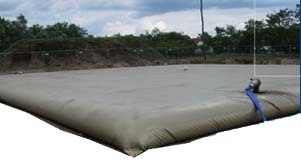 One of the main factors contractors tank into consideration with these materials is their ability to store large quantities of liquid in a single tank. The standard steel frac tank is usually designed to store either 500 BBL or 600 BBL liquid capacity, while the collapsible frac tank can store as much as 500 BBL in a single tank. This can help to reduce storage footprints and limit the amount of tanks required for location. Read more about sizes, and other Pillow Tank options.